In this continuing series, What is the church’s solution?, it’s time to address a topic that many will think is tangential at best to the mission of the church, but which is actually a vital component of how we hear what the Spirit has to say to the church in the present day: the intellectual life of the church. I really appreciate John G Stackhouse Jr.1 Beside the fact that he is a fascinating conference speaker, he just published a post “Theology and the University.” The post is written for university faculty and deans, not people like me, but I appreciate the case he makes. John provides a cogent rationale for why secular universities should still have faculties of theology rather than switching them out for faculties of religious studies. Over the last century, many such faculty conversions have been made. What does it matter? Well, John gives many reasons for why it matters, but for me it comes down to the place of religion in society. 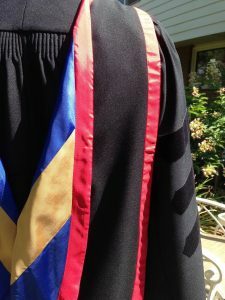 If we don’t have a place at public universities, then the study of theology becomes uniquely a responsibility of educational institutions within our religious world, publishing with publishers from within our sector who are ignored by the major book reviewers, and we lose one more point of contact with broader society as we talk just amongst ourselves. My point is that John is an evangelical scholar, a Christian intellectual with credentials that are respected outside of our Christian culture, making him just the right person to speak to academia. He was able to muster a solid, intellectually sound argument speaking up on an issue that most of us are either unaware of or haven’t given much thought to, and even if we were aware and thoughtful, we would not be equipped to argue for our interests, and then even if we were so equipped, we still wouldn’t have the credibility to be heard by anyone. John can do all of that. He is what Alan Jacobs2 refers to as a Watchman – a person who is in the vanguard of a group. He sees things before we do because of the world he inhabits, the top-tier of culture formation. Since culture change starts with the cultural elites (the true intellectuals who often are incomprehensible to the average person), it takes time for their ideas and agendas to be understood, translated, and further disseminated by people who can bridge the elite and popular worlds. By the time you and I see what is happening, it is too late to have much influence on the change. We are forced into a reactionary mode as opposed to a mode of proposal and discussion. Intellectual watchmen (let’s say watchers to include everyone) are best placed to see what is developing and enter into discussion while ideas are still being shaped. And, of course, that’s exactly what happened. But at least we were present in the debate, well represented by intellectuals who made a case for a better world. We had a voice at the table. Without the Christian intellectuals, our perspective would not even have been voiced. What happened to Christian intellectuals? After the war, Christian scholars migrated to educational institutions within the Christian sphere rather than the public sphere, and the secular academic and philosophical fields were left without a strong Christian voice since the 1950s to provide an alternative perspective.There was no one of a different perspective to thoughtfully critique the world that was being designed on a level of debate that the secular world would understand and engage with. Fortunately, in the last two decades there has been quite a resurgence in Christian scholarship, not least among Evangelicals. We still need more people who can speak the language of the academics and philosophers and who have the credentials that will be respected by a secular audience, but the current trend is encouraging. It is to the church’s advantage to have a strong intellectual life. Throughout our history, from Paul and the early Church Fathers through the Reformers of the sixteenth century to the mid-twentieth century we have always had a strong intellectual life. It is only in the twentieth century that parts of the church lost their intellectual life. It started as part of the pushback against the liberal Protestant church when Fundamentalists withdrew from higher education, which they saw as dangerous to faith. Then, against the dreams of the intellectuals who founded the Neo-Evangelical movement in the 1940s and who valued higher education, many parts of the Evangelical church also fell into the same suspicion of higher education. It’s hard to develop a new generation of scholars and evangelicals when higher education is discouraged. The lack of influence the Evangelical church has on our world today is partly due to the dearth of Evangelical intellectuals through the second half of the twentieth century. The issue for us now is, how do we support the Christian scholars we do have? And how do we not only replace them as time progresses, but greatly increase their numbers? Here are some ideas for promoting the church’s intellectual life. You can add more in the comments below! We need to train all of our church members, but particularly our younger members, to think very deeply about their faith. It must move from a basic understanding to a rock solid “I know what I believe and why.” This requires us to be comfortable with having our Christian peers and children wrestle through the issues. They need to be able to express doubts without being condemned. We shouldn’t leave them to struggle with faith privately. And they need more than facile, trite answers from us. Rather than being suspicious of higher education as a place where faith is lost, we can prepare students to function well in the secular world while maintaining a strong faith. We can acquaint them with the views they will encounter and how Christians can respond appropriately and meaningfully. Role models are always important for showing young people what their potential could be. There are lots of stories and small group video series on Christians in the workplace. A particularly good small group study is called just that, Christians in the Workplace, which includes interviews with Christians working in places of high influence. We need to raise the significance of being called to secular work. Why should we celebrate someone going to bible college more than the one going to a secular college? It would be great to have current Christian scholars and intellectuals share their ideas about how to promote the education and careers of promising young adults. You could also incorporate their ideas into your own posts and articles. Take a good idea as a jumping off point for your own post. Be sure to give credit to them and link to their books or blogs. Invite them to speak at your conference, or write for your newsletter. If their ideas relate to your audience, there’s nothing better than inspiring your audience with really big, new ideas. People generally respond well to the urgent and the immediate. If there is a pressing need, we give. If there are immediate results, we give. But the nature of intellectual life is that the returns are usually long term and very incremental. Patience is vital to success. You really need an expansive vision to see the importance of investing in high level thought leadership. It is too easy to overlook the need to fund ministries working in the intellectual part of our world. In a previous post, I promoted both Cardus and Context TV as two organizations worthy of support for their work in culture formation. Trinity Western University’s proposed law school is another. It would be (I think) the first top-tier institution in Canada in terms of Hunter’s culture matrix, and for that and many reasons, TWU deserves our generous support. In a Faith Today article, Gordon T Smith, president of Ambrose University, makes an outstanding case for “The Church + The Academy” partnership. Individual ministries can support the work of Christian intellectuals by rising to the second tier of Hunter’s culture matrix: advocacy and public education. Take the ideas flowing out of the top-tier which relate to what your ministry does, add your own deep understanding and experience, and then package it to be readily understandable and practical to your supporters. You can raise the intellectual life of the church by educating your supporters about the deeper issues of your cause. Inner city missions, for example, can discuss not just the compassionate work they do, but also the social and systemic conditions that cause people to need their services. International development agencies could address the complexities of giving aid while at the same time building sustainable communities in challenging national economies. The heritage of the Evangelical wing of the church is very much in frontline ministries serving immediate needs. Think of the Wesleys, the Booths and others who went out to the people. We tend to value “on the ground” work and might think we don’t have time for the esoteric. But it is that very work, the esoteric, which fuels the life of a community, keeping it vibrant, creative, and able to deal with the issues of the day. Deep thinkers who are attuned to the Holy Spirit. 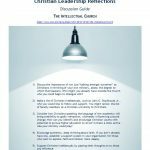 Christian intellectual life deserves our full support. Key Point: Societies, including the church, need intellectuals as the creative foundation for continued life and growth. Thanks Mark! I know you are a great supporter of higher education and critical thinking too. Thanks for the part you play in the whole. Thanks for this thoughtful post, John. We need more voices encouraging young Christians to follow their callings to different vocations, where they can serve their culture and communities in much needed ways!